OCLC Online Computer Library Center, Incorporated d/b/a OCLC is an American nonprofit cooperative organization "dedicated to the public purposes of furthering access to the world's information and reducing information costs". It was founded in 1967 as the Ohio College Library Center. OCLC and its member libraries cooperatively produce and maintain WorldCat, the largest online public access catalog (OPAC) in the world. OCLC is funded mainly by the fees that libraries have to pay for its services (around $200 million annually as of 2016[update]). OCLC also maintains the Dewey Decimal Classification system. 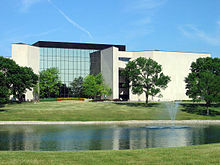 OCLC began in 1967, as the Ohio College Library Center, through a collaboration of university presidents, vice presidents, and library directors who wanted to create a cooperative computerized network for libraries in the state of Ohio. The group first met on July 5, 1967 on the campus of the Ohio State University to sign the articles of incorporation for the nonprofit organization, and hired Frederick G. Kilgour, a former Yale University medical school librarian, to design the shared cataloging system. Kilgour wished to merge the latest information storage and retrieval system of the time, the computer, with the oldest, the library. The plan was to merge the catalogs of Ohio libraries electronically through a computer network and database to streamline operations, control costs, and increase efficiency in library management, bringing libraries together to cooperatively keep track of the world's information in order to best serve researchers and scholars. The first library to do online cataloging through OCLC was the Alden Library at Ohio University on August 26, 1971. This was the first online cataloging by any library worldwide. Membership in OCLC is based on use of services and contribution of data. Between 1967 and 1977, OCLC membership was limited to institutions in Ohio, but in 1978, a new governance structure was established that allowed institutions from other states to join. In 2002, the governance structure was again modified to accommodate participation from outside the United States. As OCLC expanded services in the United States outside Ohio, it relied on establishing strategic partnerships with "networks", organizations that provided training, support and marketing services. By 2008, there were 15 independent United States regional service providers. OCLC networks played a key role in OCLC governance, with networks electing delegates to serve on the OCLC Members Council. During 2008, OCLC commissioned two studies to look at distribution channels; at the same time, the council approved governance changes that had been recommended by the Board of Trustees severing the tie between the networks and governance. In early 2009, OCLC negotiated new contracts with the former networks and opened a centralized support center. OCLC provides bibliographic, abstract and full-text information to anyone. OCLC and its member libraries cooperatively produce and maintain WorldCat—the OCLC Online Union Catalog, the largest online public access catalog (OPAC) in the world. WorldCat has holding records from public and private libraries worldwide. The Open WorldCat program, launched in late 2003, exposed a subset of WorldCat records to Web users via popular Internet search, bibliographic, and bookselling sites; Open WorldCat later morphed into WorldCat.org. In October 2005, the OCLC technical staff began a wiki project, WikiD, allowing readers to add commentary and structured-field information associated with any WorldCat record. WikiD was later phased out. The Online Computer Library Center acquired the trademark and copyrights associated with the Dewey Decimal Classification System when it bought Forest Press in 1988. A browser for books with their Dewey Decimal Classifications was available until July 2013; it was replaced by the Classify Service. Until August 2009, when it was sold to Backstage Library Works, OCLC owned a preservation microfilm and digitization operation called the OCLC Preservation Service Center, with its principal office in Bethlehem, Pennsylvania. The reference management service QuestionPoint provides libraries with tools to communicate with users. This around-the-clock reference service is provided by a cooperative of participating global libraries. Starting in 1971, OCLC produced catalog cards for members alongside its shared online catalog; the company printed its last catalog cards on October 1, 2015. OCLC commercially sells software, such as CONTENTdm for managing digital collections. It also offers the bibliographic discovery system WorldCat Discovery, which allows for library patrons to use a single search interface to access an institution's catalog, ebooks, database subscriptions and more. OCLC has been conducting research for the library community for more than 30 years. In accordance with its mission, OCLC makes its research outcomes known through various publications. These publications, including journal articles, reports, newsletters, and presentations, are available through the organization's website. OCLC Publications – Research articles from various journals including Code4Lib Journal, OCLC Research, Reference & User Services Quarterly, College & Research Libraries News, Art Libraries Journal, and National Education Association Newsletter. The most recent publications are displayed first, and all archived resources, starting in 1970, are also available. Membership Reports – A number of significant reports on topics ranging from virtual reference in libraries to perceptions about library funding. Newsletters – Current and archived newsletters for the library and archive community. Presentations – Presentations from both guest speakers and OCLC research from conferences, webcasts, and other events. The presentations are organized into five categories: Conference presentations, Dewey presentations, Distinguished Seminar Series, Guest presentations, and Research staff presentations. Advocacy has been a part of OCLC's mission since its founding in 1967. OCLC staff members meet and work regularly with library leaders, information professionals, researchers, entrepreneurs, political leaders, trustees, students and patrons to advocate "advancing research, scholarship, education, community development, information access, and global cooperation." WebJunction is a division of OCLC funded by a grant from the Bill and Melinda Gates Foundation, which provides training services to librarians. OCLC's advocacy campaign "Geek the Library", started in 2009, highlights the role of public libraries. The campaign, funded by a grant from the Bill & Melinda Gates Foundation, uses a strategy based on the findings of the 2008 OCLC report, "From Awareness to Funding: A study of library support in America". Other past advocacy campaigns have focused on sharing the knowledge gained from library and information research. Such projects have included communities such as the Society of American Archivists, the Open Archives Initiative, the Institute for Museum and Library Services, the International Organization for Standardization, the National Information Standards Organization, the World Wide Web Consortium, the Internet Engineering Task Force, and Internet2. One of the most successful contributions to this effort was the Dublin Core Metadata Initiative, "an open forum of libraries, archives, museums, technology organizations, and software companies who work together to develop interoperable online metadata standards that support a broad range of purposes and business models." OCLC partnered with search engine providers in 2003 to advocate for libraries and share information across the broadest possible Internet landscape. Google, Yahoo!, and Ask.com have all collaborated with OCLC to make the WorldCat records searchable through those search engines. OCLC's WorldCat database is used by librarians for cataloging and research. Contributions to WorldCat are made via the Connexion computer program, which was introduced in 2001; its predecessor, OCLC Passport, was phased out in May 2005. WorldCat contains records in MAchine Readable Cataloging (MARC) format contributed by library catalogers worldwide who use OCLC as a cataloging tool, and these MARC format records can also be downloaded into other libraries' local catalog systems. This allows libraries to find and download records for materials they are adding to their local catalog, without having to undergo the lengthy process of creating a new catalog entry from scratch for each new item. In December 2017, WorldCat contained over 400 million bibliographic records in 491 languages, representing over 2.6 billion physical and digital library assets, and the WorldCat persons dataset (mined from WorldCat) included over 100 million people. WorldCat is available to the public for searching via a subscription web-based service called FirstSearch, as well as through the publicly available WorldCat.org. OCLC assigns a unique control number (referred to as an "OCN" for "OCLC Control Number") to each new bibliographic record in the WorldCat. Numbers are assigned serially, and as of mid-2013 over a billion OCNs had been created. In September 2013, the OCLC declared these numbers to be in the public domain, removing a perceived barrier to widespread use of OCNs outside OCLC itself. The control numbers link WorldCat's records to local library system records by providing a common reference key for a record across libraries. OCNs are particularly useful as identifiers for books and other bibliographic materials that do not have ISBNs (e.g., books published before 1970). OCNs are used as identifiers often in Wikipedia and Wikidata. In October 2013, it was reported that out of 29,673 instances of Infobox Book in Wikipedia, "there were 23,304 ISBNs and 15,226 OCNs"; and regarding Wikidata: "of around 14 million Wikidata items, 28,741 were books. 5403 Wikidata items have an ISBN associated with them, and 12,262 have OCNs." OCLC also runs the Virtual International Authority File (VIAF), an international name authority file. VIAF numbers are broadly used as standard idenfitiers. OCLC acquired NetLibrary, a provider of electronic books and textbooks, in 2002 and sold it in 2010 to EBSCO Industries. OCLC owns 100% of the shares of OCLC PICA, a library automation systems and services company which has its headquarters in Leiden in the Netherlands and which was renamed "OCLC" at the end of 2007. In July 2006, the Research Libraries Group (RLG) merged with OCLC. On January 11, 2008, OCLC announced that it had purchased EZproxy. It has also acquired OAIster. The process started in January 2009 and from October 31, 2009, OAIster records are freely available via WorldCat.org. In January 2015, OCLC acquired Sustainable Collection Services (SCS). SCS offered consulting services based on analyzing library print collection data to help libraries manage and share materials. In 2017, OCLC acquired Relais International, a library interlibrary loan service provider based in Ottawa, Canada. OCLC has been criticized for monopolistic practices. In July 2010, the company was sued by SkyRiver, a rival startup, in an antitrust suit. Library automation company Innovative Interfaces joined SkyRiver in the suit. The suit was dropped in March 2013, however, following the acquisition of SkyRiver by Innovative Interfaces. ^ a b c 2015/2016 OCLC annual report. Dublin, Ohio: OCLC. 2014. OCLC 15601580. ^ a b "OCLC Consolidated Financial Statements 2015–16" (PDF). OCLC. September 12, 2016. Retrieved May 28, 2017. ^ "Certificate of Amendment of Articles of Incorporation of OCLC, Inc. and Amended Articles of Incorporation of OCLC Online Computer Library Center, Incorporated". Ohio Secretary of State. February 6, 1981. Retrieved May 28, 2017. ^ "About OCLC". OCLC. Retrieved 2017-05-28. ^ a b "In the beginning". Retrieved 2012-08-28. ^ Intner, Sheila (March–April 2007). "The Passing of an Era". Technicalities. 27: 1–14. ISSN 0272-0884. ^ Bates, Marcia J; Maack, Mary Niles, eds. (2010). Encyclopedia of library and information sciences. V (3rd ed.). Boca Raton, Florida: CRC Press. p. 3924. ISBN 9780849397127. OCLC 769480033. ^ Bailey-Hainer, Brenda (October 19, 2009). "The OCLC Network of Regional Service Providers: The Last 10 Years". Journal of Library Administration. 49 (6): 621–629. doi:10.1080/01930820903238792. ISSN 0193-0826. ^ O'Neill, Nancy (Nov–Dec 2004). "Open WorldCat Pilot: A User's Perspective". Searcher. 12 (10): 54–60. ISSN 1070-4795. OCLC 201889986. ^ "WikiD". OCLC. Retrieved March 5, 2015. ^ "OCLC DeweyBrowser". deweybrowser.oclc.org. Retrieved May 28, 2017. ^ "Preservation Service Center". OCLC. Archived from the original on December 29, 2003. ^ "QuestionPoint". OCLC. Retrieved May 28, 2017. ^ "OCLC prints last library catalog cards". www.oclc.org. October 1, 2015. Retrieved May 28, 2015. ^ "CONTENTdm". OCLC. Retrieved May 28, 2017. ^ "WorldCat Discovery". OCLC. Retrieved March 11, 2019. ^ Hyatt, Shirley; Young, Jeffrey A. "OCLC Research Publications Repository". D-Lib Magazine. 11 (3). doi:10.1045/march2005-hyatt. ^ "OCLC Publications". Retrieved 2012-08-28. ^ "OCLC Membership Reports". Retrieved 2012-08-28. ^ "OCLC Newsletters". Retrieved 2012-08-28. ^ "OCLC Presentations". Retrieved 2012-08-28. ^ a b c Rosa, Cathy De (October 22, 2009). "Advocacy and OCLC". Journal of Library Administration. 49 (7): 719–726. doi:10.1080/01930820903260572. ISSN 0193-0826. ^ Grossman, Wendy M. (January 21, 2009). "Why you can't find a library book in your search engine". The Guardian. ISSN 0261-3077. Retrieved 2017-05-28. ^ "WebJunction". Oclc.org. Retrieved 2014-04-30. ^ "Advocacy: From Awareness to Funding, the next chapter". 2018-07-18. ^ "Inside WorldCat". Online Computer Library Center. Retrieved February 11, 2018. ^ "Data strategy [WorldCat]". oclc.org. Retrieved 11 February 2018. ^ "Open WorldCat". Worldcat.org. Retrieved 2014-04-30. ^ Wallis, Richard (September 24, 2013). "OCLC Declare OCLC Control Numbers Public Domain". ^ "OCLC Control Number". Retrieved 2014-01-03. ^ HangingTogether.org (October 11, 2013). "OCLC Control Numbers in the Wild". ^ Jordan, Jay (March 17, 2010). "Letter to members 2010". OCLC. Archived from the original on March 26, 2010. ^ Rogers, Michael (October 30, 2007). "CLC/OCLC Pica Merge". Library Journal. New York. Archived from the original on October 28, 2008. ^ Wilson, Lizabeth; Neal, James; Jordan, Jay (October 2006). "RLG and OCLC: Combining for the Future" (guest editorial). Library and Information Science. Vol. 6, no. 4. Retrieved via Project Muse database, 2017-06-21. ^ "RLG to Combine with OCLC" (press release). OCLC Worldwide. May 3, 2006. worldcat.org. Retrieved 2017-06-22. ^ Price, Gary (January 13, 2015). "Print Collections: OCLC Acquires Sustainable Collection Services". Infodocket. Retrieved March 6, 2015. ^ "OCLC agrees to acquire Relais International to provide library consortia more options for resource sharing". January 17, 2017. Retrieved May 16, 2017. ^ Beall, Jeffrey (2008). "OCLC: A Review". In Roberto, K.R. Radical Cataloging: Essays at the Front (PDF). Jefferson, NC: McFarland & Company. pp. 85–93. ISBN 0786435437. OCLC 173241123. ^ Coyle, Karen (July 29, 2010). "SkyRiver Sues OCLC over Anti-Trust". Karen Coyle. ^ Breeding, Marshall (July 29, 2010). "SkyRiver and Innovative Interfaces File Major Antitrust Lawsuit Against OCLC". Library Journal. Archived from the original on August 2, 2010. ^ Price, Gary (March 4, 2013). "III Drops OCLC Suit, Will Absorb SkyRiver". Library Journal. Bénaud, Claire-Lise; Bordeianu, Sever (October 2015). "OCLC's WorldShare Management Services: a brave new world for catalogers". Cataloging & Classification Quarterly. 53 (7): 738–752. doi:10.1080/01639374.2014.1003668. Blackman, Cathy; Moore, Erica Rae; Seikel, Michele; Smith, Mandi (July 2014). "WorldCat and SkyRiver: a comparison of record quantity and fullness". Library Resources & Technical Services. 58 (3): 178–186. doi:10.5860/lrts.58n3.178. Breeding, Marshall (May 2015). "Library services platforms: a maturing genre of products". Library Technology Reports. 51 (4): 1–38. doi:10.5860/ltr.51n4. Jordan, Jay, ed. (2011). Weaving libraries into the web: OCLC 1998–2008. London; New York: Routledge. ISBN 9780415576901. OCLC 759584353. Maciuszko, Kathleen L. (1984). OCLC, a decade of development, 1967–1977. Littleton, Colo.: Libraries Unlimited. ISBN 0872874079. OCLC 10483157. Matthews, Joseph R. (July 2016). "An environmental scan of OCLC alternatives: a management perspective". Public Library Quarterly. 35 (3): 175–187. doi:10.1080/01616846.2016.1210440. McKenzie, Elizabeth (January 2012). OCLC changes its rules for use of records in WorldCat: library community pushback through blogs and cultures of resistance (Technical report). Boston: Suffolk University Law School. Research paper 12-06. Richardson, Ellen (January 2012). "Ain't no (Sky)River wide enough to keep me from getting to you: SkyRiver, Innovative, OCLC, and the fight for control over the bibliographic data, cataloging services, ILL, and ILS markets". Legal Reference Services Quarterly. 31 (1): 37–64. doi:10.1080/0270319X.2012.654065. Smith, K. Wayne, ed. (1998). OCLC, 1967–1997: thirty years of furthering access to the world's information. New York: Haworth Press. ISBN 0789005360. OCLC 38732191. "WorldCat data licensing" (PDF). oclc.org. Retrieved 2018-12-31. See also: "Data licenses & attribution". oclc.org. Retrieved 2018-12-31. Information about licensing of WorldCat records and some other OCLC data. Wikimedia Commons has media related to OCLC.